Jim Tooley and John Calipari talk about the United States losing to Canada in the Semi-Finals of the FIBA U19 Basketball World Cup 2017. Taking The Charge Podcast Episode 255: We look back at the FIBA U19 Women’s Basketball World Cup as well as the Centrobasket U17 Championship 2017 as well as a bit of the FIBA U18 European Championship. 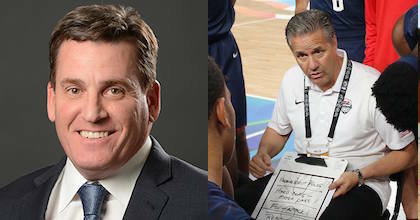 Interviews this week from the FIBA U19 Basketball World Cup 2017 with USA Basketball CEO Jim Tooley and U19 head coach John Calipari. Episode 255: We look back at FIBA U19 Women’s Basketball World Cup and the Centrobasket U17 Championship as well as a bit on the FIBA U18 European Championship 2017 Divisions A and B.